Bulgaria is a beautiful country that is gaining popularity with Western Europeans. It is a pleasure for our Team to make your vacation supreme! 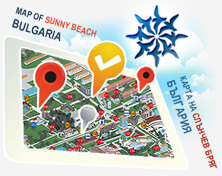 Rental Bulgaria was created to focus on property rental and to provide a complete accommodation service in Sunny Beach, covering also the areas Ravda, Nessebar, Kosharitsa, St.Vlas and Elenite. Rental Bulgaria currently has a large database of more than 300 apartments and villas in 62 holiday villages and complexes with different facilities to answer all of our clients’ requirements. Our professional team is ready to help in choosing the most suitable summer apartment for you. Having lived and worked in the area for many years the company founders and the whole staff can offer professional and sound advice to choose the perfect place for your vacation. © 2005 - 2019 RENTAL BULGARIA.